You are here: Home › Katie Arfa, Psy.D. Katie Arfa is a postdoctoral health psychologist. She specializes in the overlap between mental health (brain functioning, mood, stress) and physical health (medical illness, exercise, and nutrition). 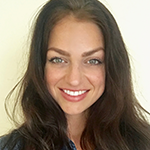 As a CNS Case Manager, she has the opportunity to engage patients in Psychiatric Rehabilitation sessions in order to make proactive changes which lead to a more healthy & functional lifestyle. In addition to clinical treatment, her work also includes research, consultation, and speaking in the community. Throughout her career, she has worked with individuals across the lifespan in many settings including primary care offices, hospitals, academic medical centers, community clinics, weight management programs, and substance abuse treatment centers. UCLA and a Master’s at Antioch University. She then went to complete her doctorate training from the California School of Professional Psychology, where she specialized in Health Psychology. In her personal time, Katie enjoys physical fitness, yoga and nutritional health. In the past, she was a NSCA certified personal trainer. CNS Health © 2019. All Rights Reserved.